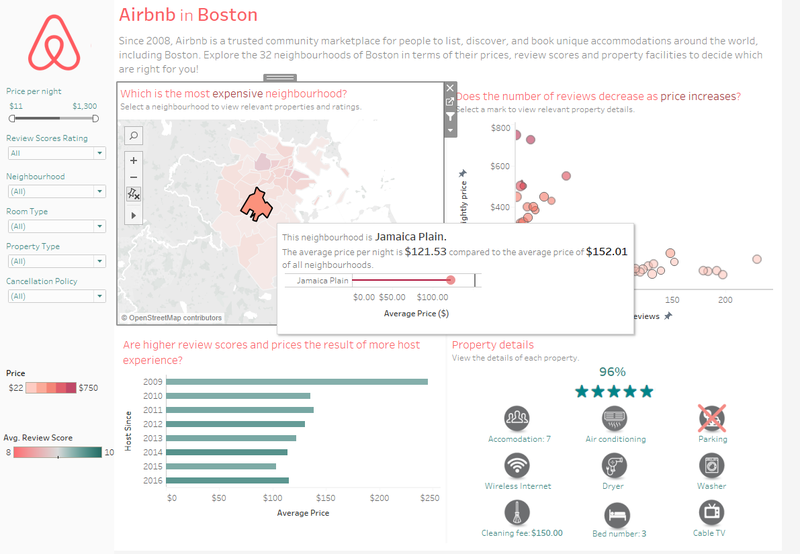 The arrival of Tableau 10.5 is accompanied by a vast amount of powerful and game-changing amendments, including the introduction of Viz in Tooltip! This design feature is here to empower your dashboard’s interactivity by allowing you to add visualizations into tooltips, displaying them when hovering over the view. Audience engagement and eagerness to explore more through increased interactivity are not the only benefits of this new feature. 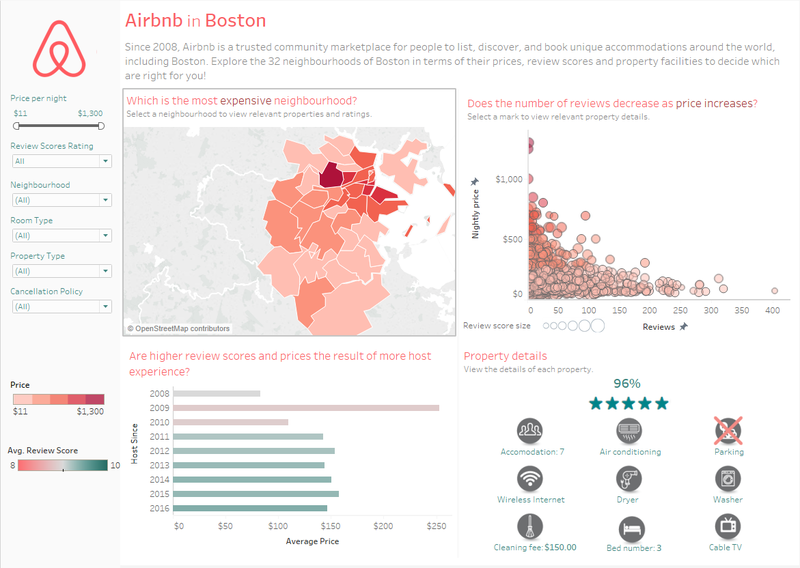 Embedding visualizations in tooltips is an additional ingredient towards cluster elimination and space availability as you no longer need to fit all sheets you want to include in your view within the dashboard dimensions, overwhelming the final view. How to add a viz in tooltips? Great news! 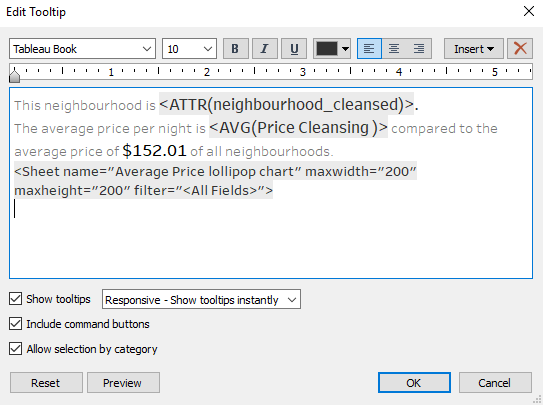 Inserting visualization in tooltips is a very simple and quick process. 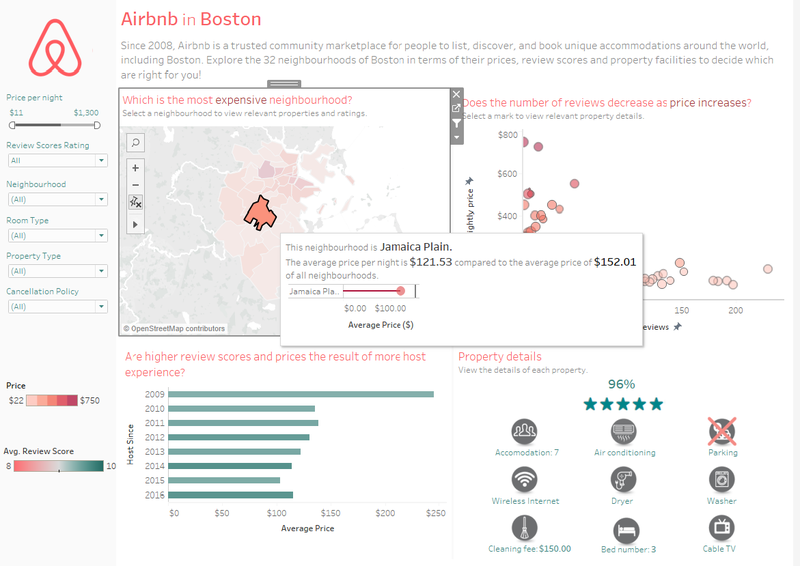 Let’s assume we have the below dashboard regarding Airbnb listings in Boston. 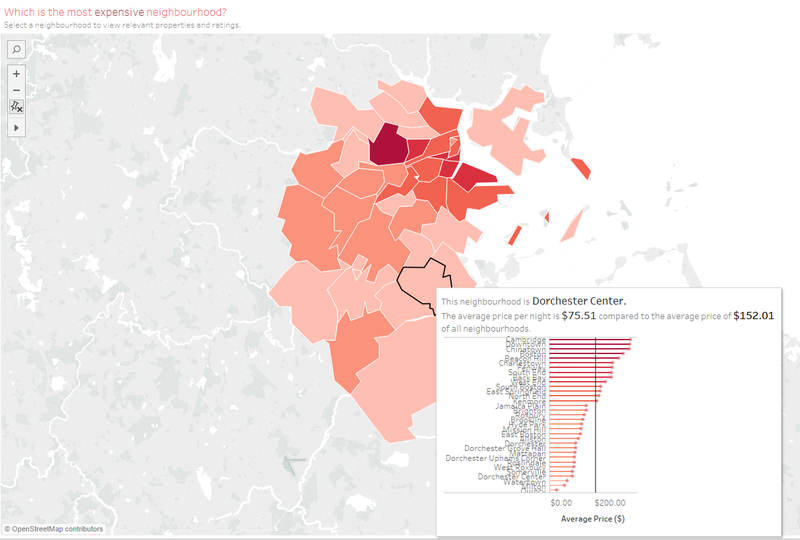 The top right map shows the Boston neighbourhoods listed in terms of price (the darker the colour, the more expensive the accommodation). 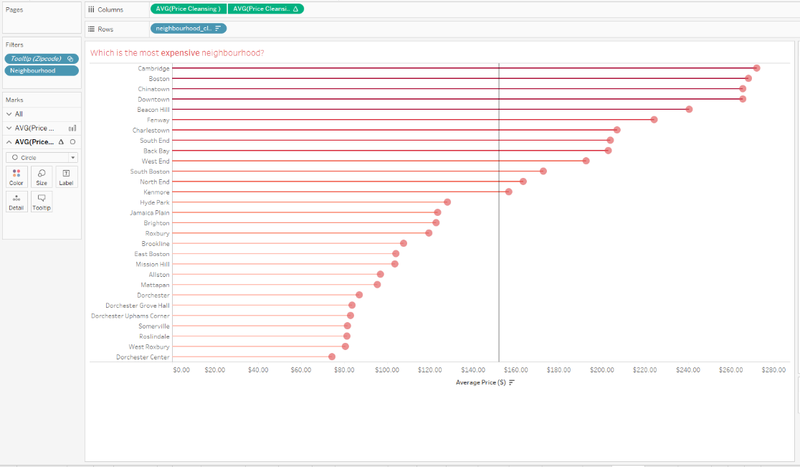 We would also like to add a viz showing the average price of each neighbourhood compared to the average price of all neighbourhoods. However, an additional viz will make it difficult to focus on the key areas and may change the flow of the story. 1. Create a worksheet with the visualization you want to add, known as the target sheet. 2. Go to the worksheet you want to have the viz inserted in its tooltip, known as the source sheet (in this example map sheet) and select the Tooltip shelf in the Marks card to edit the tooltip content. 3. Select ‘Insert’ to open the Insert menu and then ‘Sheets’ to choose the target sheet created in step 1. Note that you may add more than one target sheet in the tooltip for more visualizations to be revealed when hovering over the source sheet. 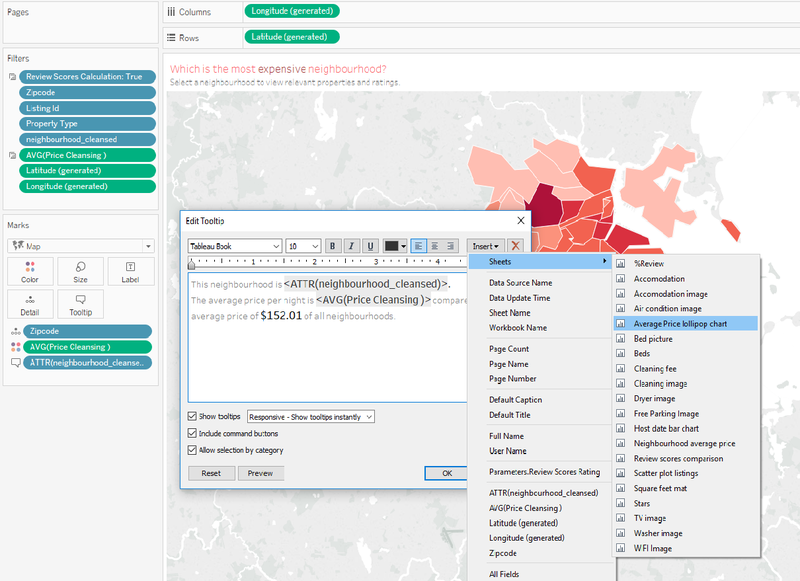 The viz can be combined with text and dynamic fields which were also features of previous Tableau versions. It is worth mentioning that, while you may add several sheets in a tooltip, a specific sheet can only be used in one tooltip at a time. The viz is now inserted in the tooltip. Hover over the source sheet to see the astonishing results! Viz with dual axis – how can you best utilize your tooltips? This means that, by default, Tableau creates a 300x300 pixels tooltip box. Nevertheless, you can manually change the width and height of the tooltip to the dimensions you prefer. For example, if I want the viz in the tooltip to take less space of my view, I can replace these numbers with 200 and hover over the map to check the size of the tooltip. In cases where the viz inserted is too large to display in the default dimensions, a message at the bottom of the tooltip “View is too large to show” will appear as an alert for a manual update of the dimensions. Alternatively, rather than increasing the tooltip dimensions, you can adjust the target sheet to Entire View to fit the default dimensions. According to Tableau, it is recommended not to exceed 600 pixels as this may draw attention away from the main view. 2. 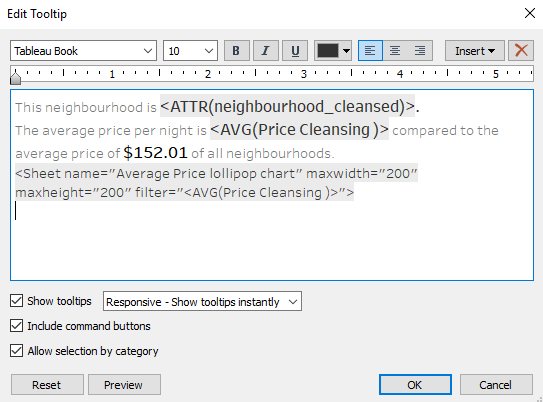 The target sheet automatically adopts a Tooltip filter based on the fields included in the source sheet. 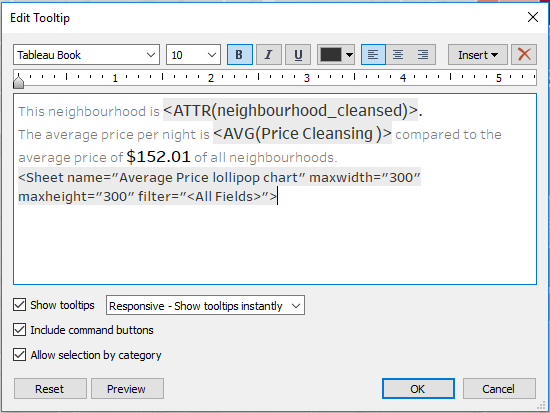 This allows you to see the viz in the tooltip filtered by the specific mark you hover over – referring to the first example above, the target sheet has both the zip code and neighbourhood filters. 3. Be aware that changing the visualisation of the source sheet from Show Me will remove the viz added in the tooltip and you will have to re-apply the procedure – luckily, it’s fast! Viz in Tooltips is finally here… Embrace it! For details on the new features of Tableau 10.5, visit What's New in Tableau.